The mbNET.mini is a compact Industrial Router ideal for M2M applications. The router offers secure remote access to PLCs, PLC to cloud data collection, and cloud data visualization in a single box. The router ensures maximum access protection by allowing remote access only to identified and authenticated users. Additionally, the router offers USBoverIP capability to remotely access and control USB devices connected to the USB port of the router. These features make the mbNET.mini an affordable Industrial Internet of Things (IIoT) gateway for a variety of applications, with no additional cloud development required! 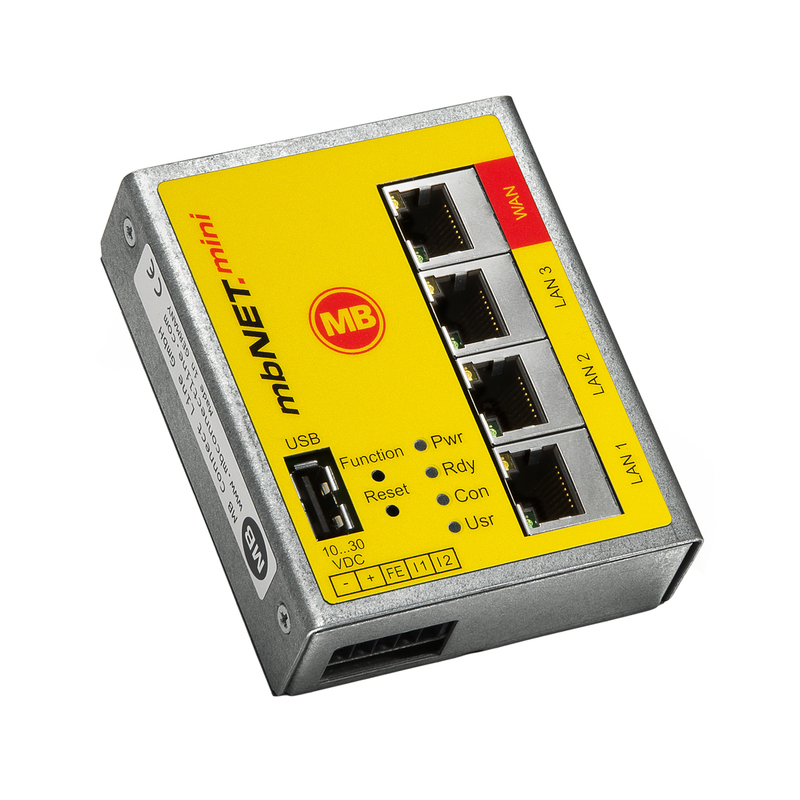 Use the mbNET.mini to gather Tag data from Ethernet connected PLCs and push the data to a free cloud account (up to 50k data consumption and up 250 data points) known as mbCONNECT24. Create dashboards using an extensive widget library, monitor process values, create alarms when limits are exceeded. Alerting methods include email, SMS, or text-to-speech phone call (fee). Use the cloud account to create reports, archive data and more. The free cloud account is available on the mbCONNECT24 public cloud. Upgrading performance levels is possible. Other cloud options include a complete private cloud solution with server hardware hosted at the end user facility, and the option of a virtual private cloud – hosted on the end-user’s platform or cloud service. The mbNET.mini router has 4 ports, which can be ordered as 1 WAN + 3 LAN , or just as 4 LAN. For the 4 LAN port version, options for connecting to the internet are 3G, 4G modems or WLAN Wi-Fi. Remote access security is achieved through encrypted connections (SSL/TLS). The mbNET.mini serves as a firewall to the outside world. It allows transparent access to PLC, HMI and other end devices. Via a web browser, users can visualize equipment, read operating data or manage the process, view webservers in PLCs, and even view an IP enabled security camera. The USB over IP feature allows users to access remote USB devices such as PLCs, HMIs, webcams, USB memory sticks, etc. The mbNET.mini can be configured through the cloud account or through a web server on the unit. Configurations can be easily saved as files or templates and used to configure other units when deploying multiple units.